Universal 2 Din Car DVD Player. • The holder can be adjusted at any angle to suit the driver's need. It has super strong suction with the silicone sucker ,it can be even mount on the drywall, now on the market there are many cheap ones that has more weaker suction, can not be mounted on the drywall, desktop and so on. Specification: 100% brand new and high quality Perfect for holding your digital product onto your car dashboard Small & Compact size, without blocking your sight and space saving Super strong magnetic, easy to put on and take down, safe and convenient to drive With antirust ball shaped base and magnetic piece Magnetic piece can strongly stick to the antirust ball shaped base and other ferric stuff 360° rotation, free height and angle adjustment Compatible with any mobile device, such as phone, ipad, GPS, etc Material：Metal Plastic Package: 1x Magnetic Car Phone Holder Note: Due to the light and screen difference, the item's color may be slightly different from the pictures. Flexible support can turn 360 degrees, freely adjust to any desired angles. Red silicone mat, effectively reduce friction. 1 x Car holder （phone does not included）. Powerful suction, pulling super strength, can ride on any surface, as winshield, dashboard, table and so on. Universal Car Air Vent Phone Mount Holder foriPhone,Samsung,HTC and so on Devices that less than 90mm Wide. Just in case any delay during the transmit. - Attach to the Car Air Vent with the strong clip grip. Introduce about the item Adjustable and fits firmly in the cup holder for car, truck or SUV. Base expands to fit any vehicle cup holder; no suction or adhesive required. Adjustable base for a perfect fit in most cars' cup holders. Easy installation on any CD slot and air vent. 1x Car CD Slot Phone Mount (not include the phone). Color: black grey. Universal fit most smart phones between 58-90mm width. Pocket sized, small enough to fit in your pocket and carry. 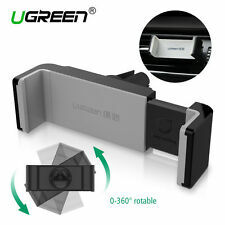 UGREEN Car Air Vent Mount Phone Holder Compatible for iPhone XS X 8 7 6S 6 Plus, Samsung Galaxy S9 S8 S7 S6 Edge, Google Pixel 2 XL, LG V30 V20 G6 G5, OnePlus 5T, Gravity Cell Phone Cradle. Free your hands while driving. Ugreen wall mount phone holder can give your phone and tablet a safe dock while charging. It is the perfect storage solution for your iPhone when it is charging. COMPATIBLE PHONE&TABLET - The Wall Phone Holder Compatible with virtually every smartphone & tablet (thickness within 14mm) such as iPhone, iPad, most Android phones and tablets, and gives your device a safe dock while charging.